We measure our Manuka Honey using the NPA activity rating system, the higher the NPA rating, the higher the Non-Peroxide Activity. Manuka honey is one of the most sought-after honeys in the world due to its unique nutritional profile and powerful antibacterial properties. Unfortunately, there are products out there claiming to contain “authentic” Manuka honey – when in fact they only contain very little or none at all. If you are looking for genuine Manuka honey of world-class quality, your best choice is none other than Rowse Manuka Honey Active 15+! Authentic Manuka honey can only be obtained from honeybees that pollinate New Zealand Manuka trees. Compared to ordinary flower honeys, Manuka honey contains up to 4 times more nutritional content, which includes amino acids, vitamins, minerals, and enzymes – all the good stuff that keeps your body exceptionally healthy and strong. Rowse Manuka Honey Active 15+ contains significant amounts of methylglyoxal (MGO), the active component that dictates the Non-Peroxide Activity (NPA) in each jar. It gets a 15+ NPA rating, which means that it contains significantly higher levels of therapeutic phenols than regular honeys. To ensure unbeatable purity, safety, and authenticity, Rowse Manuka Honey Active 15+ undergoes two quality tests – once in New Zealand and then another as soon as it reaches the UK. 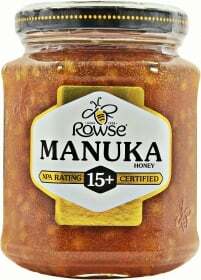 What benefits do you get by consuming Rowse Manuka Honey Active 15+? Enjoy genuine Manuka Honey and experience its incredible health-boosting benefits every day... try Rowse Manuka Honey Active 15+ today, at its best price only from Zumub! Have a question about Manuka Honey Active 15+? What is it, what does it do, how and when to use or something else? Ask us. “Rowse Manuka Honey Active 15+ 250g - Opportunity” is currently out of stock. Enter your details below and we will let you know when it's back in stock. WARNINGS Manuka Honey Active 15+ : 15+ NPA Manuka honey is guaranteed 100% pure and authentic. We measure our Manuka honey using the NPA activity rating system - the higher the NPA rating, the higher the Non-Peroxide Activity. Honey is unsuitable for infants under 12 months. Not for external use.